The Wheat Shed in Calthwaite, near Penrith sleeps 8 people. The Wheat Shed near Penrith is in a great rural location situated in the beautiful and picturesque countryside within the Eden Valley. Adjacent to the owner’s home, it lies just 10 miles from Penrith, and 13 miles to Pooley Bridge at the head of Ullswater. This semi-detached barn conversation is set on the owner’s working farm with beef, sheep and arable, with a woodland area and an abundance of wildlife including swans, ducks, geese, woodpeckers, deer and much more. Ideal for guests wanting to really explore the local area and beyond, with plenty of attractions within a close radius. Experience the Lake District at its best with every kind of outdoor activity on hand. The Wheat Shed is a haven away from the stresses and strains of everyday living and is ideal for anyone looking to spend some time amidst the peace and quiet of beautiful scenery. Enjoy sailing on Ullswater or take in the magnificent scenery on a launch trip up the lake. This beautiful region offers something for everyone. The shop is 3 miles, with the pub and restaurant 1½ miles from The Wheat Shed near Penrith. The Wheat Shed can be booked with The Bothy (ref 29699 [The Bothy]) to sleep up to 12 people. Utility room: With freezer, washing machine and tumble dryer. Bedroom 1: With king-size bed and en-suite wet room with shower and toilet. Bedroom 2: With king-size bed and en-suite wet room with shower and toilet. Biomass central heating, electricity, bed linen, towels and Wi-Fi included. Travel cot, highchair and stairgate available on request. Enclosed garden with sitting-out area and garden furniture. Children’s play area with zip wire. 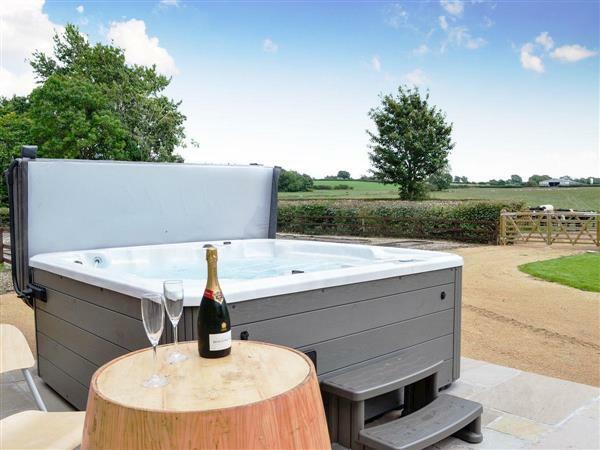 Hot tub for 8 (private, £75 per week). Private parking for 4 cars. No smoking. Please note: There is an enclosed pond in the grounds, 75 yards away. Holidays at The Wheat Shed run from Friday to Friday. For a better idea of where The Wheat Shed is, you can see The Wheat Shed on the map below. The Wheat Shed is in Cumbria; should you be on the lookout for a special offer, you can find all the special offers in Cumbria. It's always worth checking to see what is on offer at the moment. Do you want to holiday near The Wheat Shed (UKC1165), you can see other cottages within 25 miles of The Wheat Shed; have a look to find your perfect holiday location.